This tutorial will be showing you how to protect your DNS privacy on Ubuntu 18.04 desktop with DNS over TLS. We will use a tool called stubby to achieve that. But first, let me tell you why DNS is not secure. DNS is insecure because by default DNS queries are not encrypted, which can be exploited by middle entities. DNS cache poison is one of the DNS abuses that is widely used by the Great Firewall of China (GFW) to censor Chinese Internet. GFW checks every DNS query that is sent to a DNS server outside of China. Since plain text DNS protocol is based on UDP, which is a connection-less protocol, GFW can spoof both the client IP and server IP. When GFW finds a domain name on its block list, it changes the DNS response. For example, if a Chinese Internet user wants to visit google.com, the Great firewall of China returns to the DNS resolver an IP address located in China instead of Google’s real IP address. Then the DNS resolver returns the fake IP address to the user’s computer. What is DNS over TLS? How It Protects Your Privacy? DNS over TLS means that DNS queries are sent over a secure connection encrypted with TLS, the same technology that encrypts HTTP traffic, so no third parties can see your DNS queries. Together with HTTPS and encrypted SNI (Server Name Indication), your browsing history is fully protected from ISP spying. Stubby is an open-source DNS stub resolver developed by the getdns team. It uses the getdns library. A stub resolver is a small DNS client on the end-user’s computer that receives DNS requests from applications such as Firefox and forward requests to a recursive resolver like 1.1.1.1 or 8.8.8.8. Stubby is special in that it supports DNS over TLS. By default, it will only send DNS requests encrypted. There is another open-source stub resolver called cloudflared that supports DNS over HTTPS but stubby is already in Ubuntu 18.04 repository and is very easy to use. Stubby is in Ubuntu 18.04 repository. Open up a terminal window and run the following command to install it. The default stub resolver provided by systemd-resolved listens on TCP and UDP port 53 of 127.0.0.53. Note: If dnsmasq is listening on TCP port 53 of 127.0.0.1, then Stubby will listen only on UDP port 53 of 127.0.0.1. The following line makes stubby run as a stub resolver instead of a full recursive resolver, which is why it’s named stubby. The following configuration make stubby send DNS queries encrypted with TLS. It will not send quries in plain text. This following line requires a valid TLS certificate on the remote recursive resolver. The following lines set the listen addresses for the stubby daemon. By default, IPv4 and IPv6 are both enabled. The following line make stubby query recursive resolvers in a round-robin fashion. If set to 0, Stubby will use each upstream server sequentially until it becomes unavailable and then move on to use the next. By default there are 3 recursive resolvers enabled in stubby configuration file. They are run by stubby developers and support DNS over TLS. You can see the full list of recommended servers on DNS Privacy website. There are other DNS servers in the Additional Servers section that are disabled by default. There are also DNS servers listening on port 443. If port 853 is blocked in your network, you can uncomment them to use these servers. Now you can exit nano text editor by pressing Ctrl+X. Editing the /etc/resolve.conf file to change name server is not recommended any more. Follow the instructions below to make systemd-resolved send DNS queries to stubby. 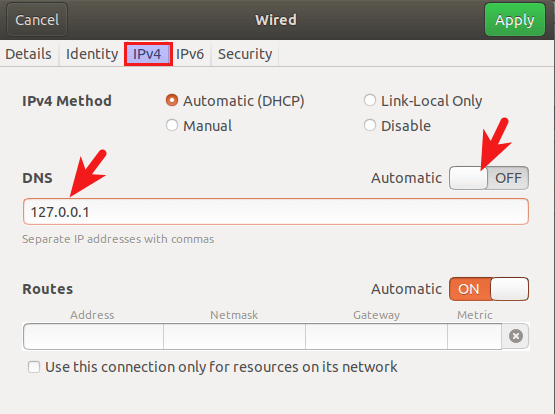 Select IPv4 tab, then in DNS settings, switch Automatic to OFF, which will prevent your Ubuntu system from getting DNS server address from your router. Enter 127.0.0.1 in the DNS field. Click Apply button to save your changes. Then restart NetworkManager for the changes to take effect. 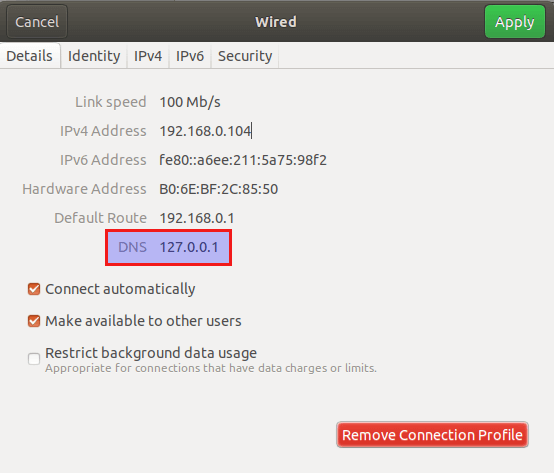 Once you are reconnected, you can see that your Ubuntu system is now using 127.0.0.1 as the DNS server in the Details tab. Recommended reading: how to install Unity desktop environment on Ubuntu 18.04. Click the Network Manager icon on the upper-right corner of your desktop, then click edit connections. Select your connection name and click the gear icon. 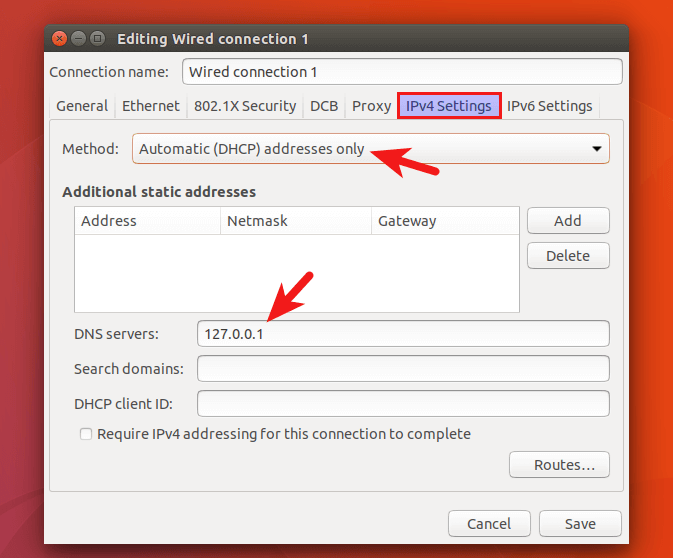 Select IPv4 settings tab, change method from Automatic(DHCP) to Automatic(DHCP) addresses only, which will prevent your Ubuntu system from getting DNS server address from your router. Then specify a DNS server (127.0.0.1). Stubby listens on 127.0.0.1. Save your changes. Then restart NetworkManager for the changes to take effect. 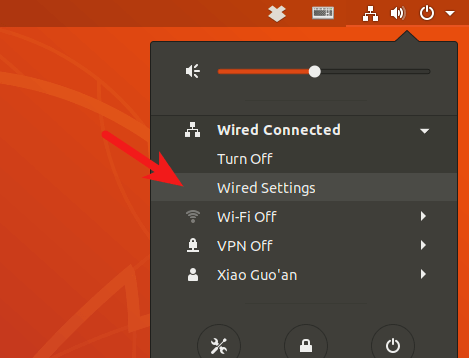 Once you are reconnected, click the Network Manager icon again and select connection information. 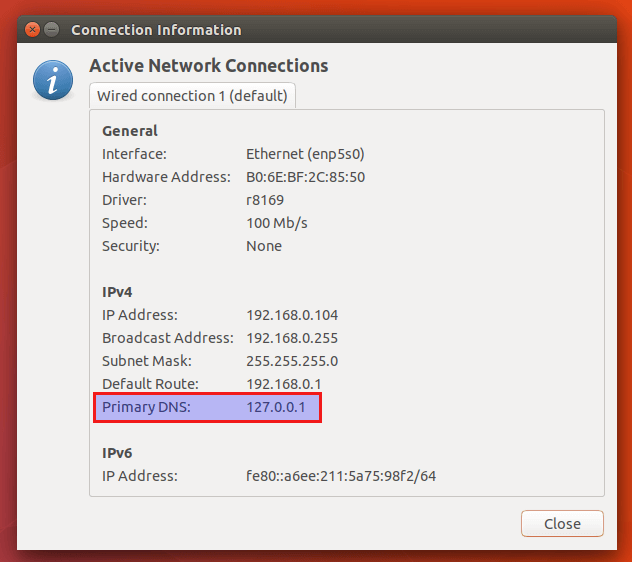 You can see that your Ubuntu system is now using 127.0.0.1 as the DNS server. You can use the method below to change DNS server as only as your desktop environment is using NetworkManager. 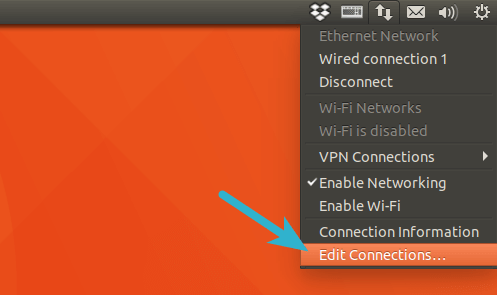 Open a terminal window and go to the Network Manager connections profile directory. 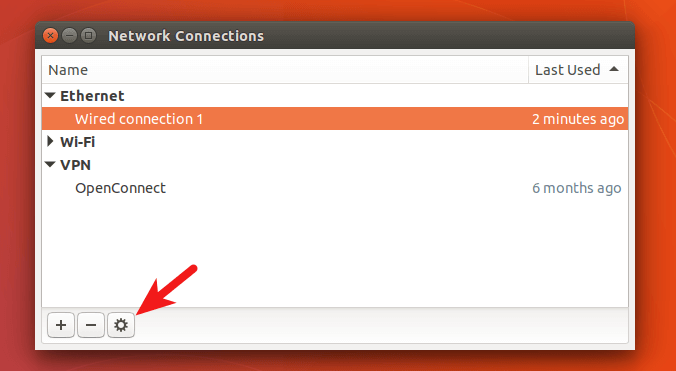 Then list connection names available on your system. As you can see, I have several connections on my system, one of which is wired connection. Some are wireless connections and one is VPN connection. Because my desktop computer is connected to my router via an Ethernet cable, so I need to edit the wired connection profile with the nano command line text editor. To make your system use Stubby, change the configurations to the following. To save the file in Nano text editor, press Ctrl+O, then press Enter to confirm. Press Ctrl+X to exit. Then restart Network Manager for the changes to take effect. If 127.0.0.1 is listed as the DNS server, then your system is using Stubby. We can use WireShark to monitor DNS traffic. Install WireShark from Ubuntu 18.04 repository. If you are asked “Should non-superusers be able to capture packets?”, answer Yes. Once it’s installed, run the following command to add your user account to the wireshark group so that you can capture packets. Log out and log back in for the changes to take effect. Then open WireShark from your application menu, select your network interface in WireShark. For example, my Ethernet interface name is enp5s0. Then enter port 853 as the capture filter. This will make WireShark only capture traffic on port 853, which is the port used by DNS over TLS. Click the button on the upper-left corner to start capturing. After that, in terminal window, run the following command to query domain name by using the dig utility. For instance, I can query the A record of my domain name. 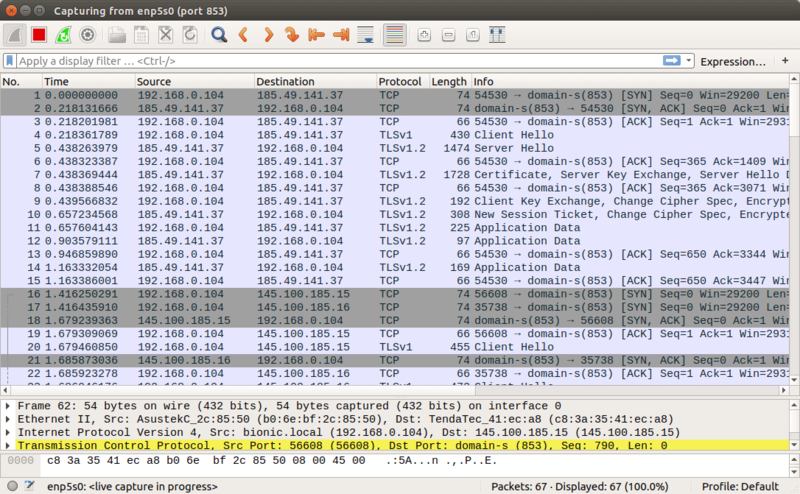 Now you can see the captured DNS traffic in WireShark. As you can see, my DNS query was sent to 185.49.141.37, 145.100.185.15 and 145.100.185.16, which are the 3 default DNS resolvers defined in stubby configuration file. Connections were made over TCP and encrypted with TLS, which is what I want. If DNS queries are sent without encryption, then the computer would contact DNS server on port 53. You can capture packets again with port 53 as the capture filter, but you won’t see any packets in WireShark, which means stubby is encrypting your DNS queries. I found that there is high latency (over 200ms) between my computer and the 3 default DNS servers, whereas CloudFlare DNS servers (1.1.1.1, 1.0.0.1) give me very low latency (below 20ms). CloudFlare also supports DNS over TLS. To add CloudFlare DNS server, edit stubby configuration file. Scroll down to the upstream_recursive_servers: section and add the following text above other DNS servers. Change 1 to 0. This will make stubby always use CloudFlare DNS server. If CloudFlare is not available, stubby will use other DNS servers. Save the file and restart stubby for the changes to take effect. I hope this tutorial helped you protect your DNS privacy on Ubuntu 18.04 with DNS over TLS. As always, if you found this post useful, then subscribe to our free newsletter to get more tips and tricks. Take care. I am on Xubuntu 16.04… as such, stubby is not in the repository. I am a relatively amateur Linux user, so I was wondering if I could get some alternative instructions for my scenario. TIA. (I’ve included what happens when I go to install stubby). You can compile stubby from source and create a systemd service unit. You can also try upgrading from 16.04 to 18.04. Eventually, you will need to do this when 16.04 reaches end of life. sir, what about opendns, whether it can be used as DNS over TLS. how to use stubby under Ubuntu 16.04 LTS desktop. It is not in the repository. whether stubby can be installed from the following for Ubuntu 16.04 (https://gist.github.com/LeeiFrankJaw/0735005da8ecbb730861ea03b7af261b). going for fresh install of 18.04 always there. would like to use opendns or ibm quad or googld dns or native dns provider. how to check whether native dns provider supports dns over tls? If the output of systemd-resolve --status contains DNS Servers: 127.0.0.1, then your system is using Stubby. I’m not using XFCE desktop, but I added instructions on changing DNS server from command line. Please see “A Desktop-Agnostic Way to Change DNS Server” section in this article. Thank you Xiao, very useful resource.